This article details how to create a Group which has more than one rule determining the members. This is usually an easy process, but the main problem that arises is the incorrect use of And/Or Conditions. Read more to learn how to get it right every time. Once you have created your group, click into it to open the above screen. 1. Select "Add Rule". This will expand a pop-up as shown below. Select the Campaign you are referring to. The count of contacts that met the rule conditions. A rule can be changed at any time by pressing the edit pencil. You can delete a rule using the delete button. Now repeat the add rule process to add a second, third, fourth or even fifth rule. A rule can be changed at any time by pressing the pencil shown in the left. Survey Rule - list of people who have answered a survey question in a particular way. Article Rule - list of people who have received a certain article. Finally once all the rules have been added make sure your operators or conditions have been set up correctly. 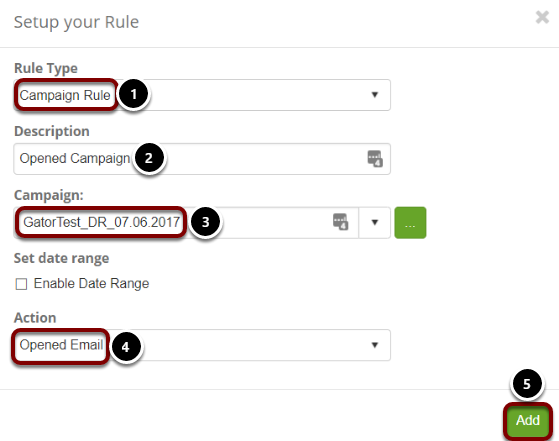 Using 'And' means that both rules need to be matched for a contact to be included in the group. Using 'Or' will mean that a contact only needs to match one of the rules to be included in the group.